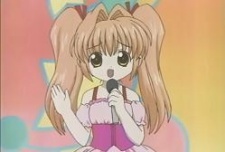 Kusachiho, the combined human form of all four Bottle Fairies is called Onee-chan by some fans and Uni-chan by others. Her name is a contraction of the fairies' names by using the first Japanese character of each. Predictably, she has what may be classified as dissociative identity disorder, and has the personality traits of all the Bottle Fairies. Which fairy is in control is indicated by the color of her eyes and her voice. Her color is orange. She only appears in the final two episodes.